Place wooden skewers in cold water to soak. Whisk together the marinade ingredients until smooth. Add the chicken, cover and chill for one hour (or up to four hours). Once the chicken is sufficiently marinated, heat the grill on its medium setting or prepare charcoal for cooking. Thread the chicken strips onto the water-soaked skewers. Grill for 3-4 minutes per side, until cooked through. Meanwhile, whisk together the dipping sauce ingredients. Serve immediately, with the dipping sauce. The first time I had chicken satay, I was about 14 years old and in Cape May, New Jersey, with my friend’s family. Her aunt was getting married, and we were hosting a bridal shower at the rental house we were staying in. My friend’s mom had me make the dipping sauce for the satay. I thought the combination of peanut butter and soy sauce would never, ever work. Frankly it seemed bizarre. But once all was said and done, I discovered that the combination was killer – and the chicken was the best I ever had. I may or may not have single-handedly polished off the leftovers. Since then, satay has become a mainstay for me whenever I see it on a menu. And if it comes with rice noodles, all the better. Recently I introduced my family to the joy that is this dish. My Chicken Satay with Asian Dipping Sauce is easy to make – only 4 ingredients for the marinade and 5 for the dipping sauce. But simplicity aside, it’s a delicious, delightful dish to serve as an appetizer or as part of dinner. Try serving it with Seasoned Rice Noodles with Cucumber and Carrot Salad. It’s a great combination! Interested in a different dipping sauce? 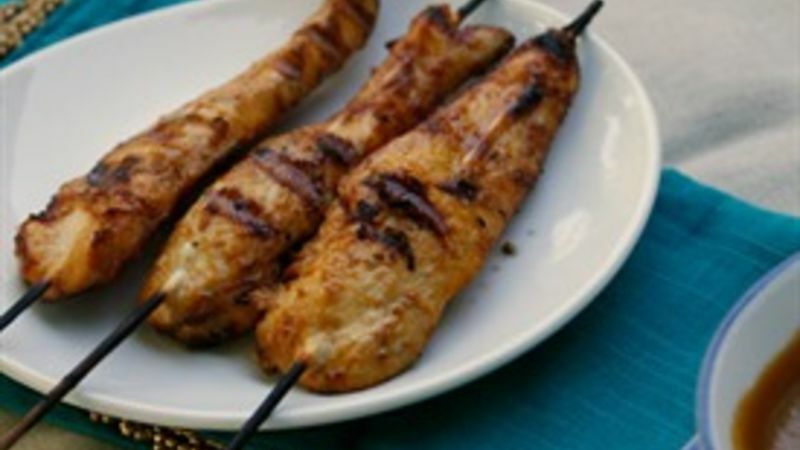 A peanut and soy sauce dipping sauce, like the one included in this recipe, is common for satay. But there are other dipping options such as yogurt-cucumber sauce. You could also go hotter with the dipping sauce, adding some sweet chile paste to it.